Getting hotels and tours back up and running before the winter rush. That was one of the goals of the VI Destination Symposium. Representatives from several travel companies, over 75 of them, met at the Great Bay Resort in St. Thomas Thursday Aug 16. Wednesday they met in St John and St Croix before that, to meet with on island travel partners and discuss a variety of issues impacting the tourism market. Hosts of the event included the USVI Department of Tourism, and they tell USVI News about 60% of the hotel accommodations are back open. They have confirmed the opening dates for about 95% of the hotels that are currently closed. “We are getting calls on a daily basis we want to come for Christmas again we want to come for Thanksgiving again and we want to see what’s going on, we want to support you, and we’re saying come we welcome you,” Joyce Griffin, Assistant Commissioner at the Department of Tourism said. 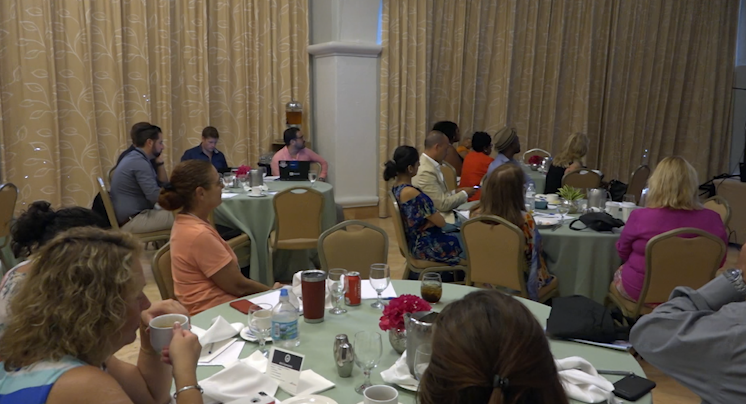 “This is our 25thannual Destination Symposium so we bring these travel partners in to see how we’re doing and usually its just an update what’s happened year over year, but this year obviously specially important to let them know that we are open for business,” Lisa Hamilton with the USVI Hotel and Tourism Association added. From here the tour operators and hotel companies get back to work bringing in tourists and let them know it I safe to return here and get that business back up and running.